At Shoreline Covenant Church we seek to provide opportunities for adults to grow in their understanding and practice of the Christian Faith and thereby deepen their relationship to Jesus Christ. Our ministries to adults provide a range of options for learning, growth and fellowship throughout the year. Here are the ministries we provide to help adults achieve those goals. To get involved, or for more information on any of these ministries, please click on the links below or contact the SCC office. We’d be glad to connect with you! Our spring 2019 Sunday school series will focus on missions and community engagement by SCC members and/or long-time SCC ministry partners. Here from speakers sharing about their work with Christian Veterinary Mission, Studio, King County Jail Ministry, and Urban Impact. Some speakers will also share during our Sunday worship service, and there will be some opportunities to share lunch with some speakers after church to ask more in-depth questions. Please contact the church office if you would like more information. 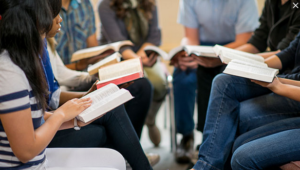 September through May, adults of all ages meet at 9:00am for a variety of educational opportunities, including participatory Bible studies, guest lecturers, and elective classes that cover a wide range of topics. Recent topics have included the life of Abraham; C.S. Lewis’s The Screwtape Letters; how to hear and discern God’s voice; and racial reconciliation. Nursery care and Sunday school are available for children and youth during this time period as well. For more information, or for locations for studies not meeting at church, please contact the office. In our local community we support, and volunteer with, Hopelink, Jacob’s Well, Ronald Commons, Mary’s Place, Urban Impact, Elizabeth Gregory Home, Echo Lake Elementary School, Gideons, and jail ministry. Nationally and internationally we support 18 ministries and missionaries from places ranging from Los Angeles and Alaska, to Southeast Asia, the Democratic Republic of Congo, and the Middle East. Care Ministry provides an opportunity for us to serve one another, by helping to fill urgent or emergency needs of those within our church body. Celebration Ministry honors women as they enter into marriage or motherhood. 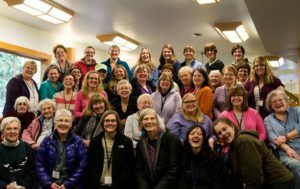 Fellowship Ministry helps women connect and build relationships, with each other and our community, and Open Door Ministry seeks to welcome newcomers and create a sense of belonging for all of the women of our church. Missions Ministry provides opportunities to meet with our women missionaries and connects us to our missionaries in the field. Quilt Ministry provides an opportunity for women to make quilts for people who are transitioning from being homeless or facing a special challenge; for graduating high schoolers in the church; for fundraising auctions; and more. Meets 1st and 3rd Wednesdays, 9:30am-12pm. All skill levels welcome! The goal of Men’s Ministry is to connect men of Shoreline Covenant with their Lord and one another. Through Bible studies, disciple groups, and special events we seek to support and nurture each other in our faith-walk in Christ. Monday Men’s Fellowship meets on Monday mornings at church, 8–10am, for coffee and fellowship; all ages welcome, just show up! Thursday Morning Men’s Group meets Thursday mornings at Family Pancake House in Edmonds, 8am; breakfast and a more intentional time of sharing and prayer; all ages welcome, please RSVP to the office if you are a newcomer planning to come, so we can make sure to save a seat at the table for you! The Evangelical Covenant Church addresses sexual assault and its related concern, domestic violence, through the Advocacy for Victims of Abuse (AVA) initiative. As a church we acknowledge the reality of brokenness and sin in the world as well as the power of the community to heal brokenness through Jesus Christ. AVA informs, educates, and raises awareness in our congregations and communities. If you are interested in joining SCC’s coordinating team for our growing AVA ministry, please contact the office. Also, SCC will be hosting a broader training regarding AVA, and related topics, on May 11. This training is open to the public, both those who attend SCC and those who do not but would be interested in becoming better educated and equipped to respond to sexual assault and domestic violence in the community. To sign up for the training, please visit: https://eccavatraining.eventbrite.com.